There's no telling when it will strike, there does not seem to be any rhyme or reason to it, and there is no escaping it: it's the "Third Trimester Pregnancy Craving." 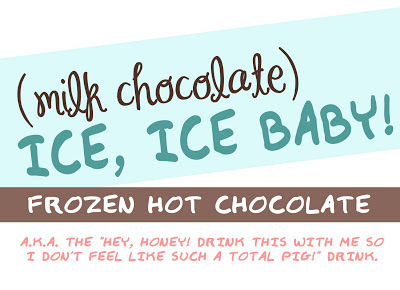 And tonight, it was frozen hot chocolate. I've never even had frozen hot chocolate before, so I have literally NO idea where in the world this craving originated. Usually when a craving like this one hits, I putz around the kitchen awhile throwing things together and furiously jotting down notes only to find out it was a one-time indulgence (or a complete failure). This time, though, Baby and I actually came up with an amazing recipe I wouldn't mind enjoying sans hormonally-influenced pigging out! 1) Open your package of milk chocolate chips. Eat one or twelve chocolate chips. Then, melt 1/2 cup or so in a saucepan over medium heat. Eat another one or twelve out of the bag as the chocolate melts before "hiding" them from yourself and trying your best to forget about them. Stir your chips as they melt to ensure they melt evenly and don't scorch. 2) Once your chips are melted (have you forgotten where you put the bag yet? ), add your unsweetened cocoa powder, cream of tartar, 1/2 tsp of Truvia (or 1/2 TBSP sugar), and 1/2 cup of milk. Stir until smooth, then remove from heat and allow to cool slightly, continuing to stir. Add remaining 1 cup of milk and 2 tsp of Truvia (or 1 TBSP sugar) and stir well. 3) Place 3 cups of ice in a blender and pour chocolate mixture over top. Blend well. Pour into glasses and serve with whipped cream, extra chocolate chips, chocolate shavings, or twisty straws -- whatever makes you feel like the queen you are! 4) Convince your spouse to drink 1/2 of the concoction because you realize you made too much and don't want to overindulge. Chances are, he won't mind one bit. 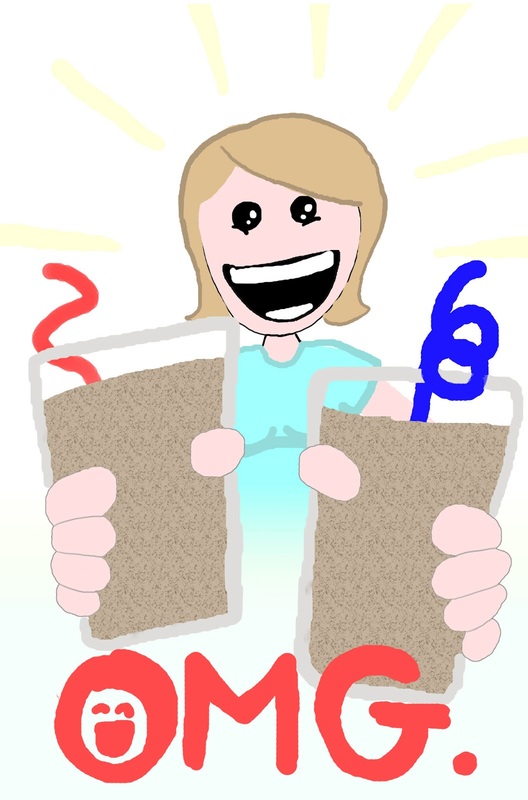 5) Relax, sip away, and enjoy! Edit: Maybe it's just because it's past my bed time (or because I'm hyped up on chocolate?) 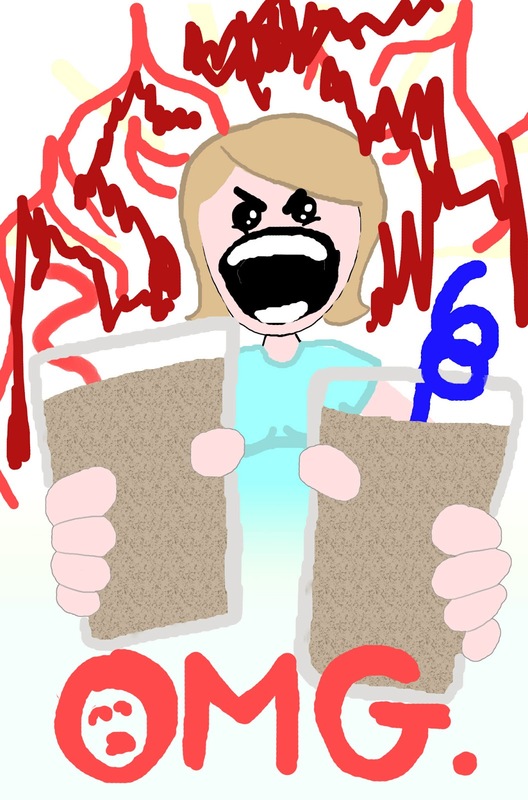 but I keep looking at that little doodle I did of myself holding the drinks and thinking, "Look, honey, I made you a drink! Now drink it with me! OR ELLLLLSE!!!" Aaaaand I'm spent. You're welcome, internet.